Change can have unintended consequences, adversely affecting business critical processes. 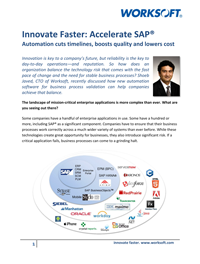 Download this white paper, Innovate Faster: Accelerate SAP(R), to understand how new automation software for business process validation can help stabilize technology-based environments and reduce the risk associated with working with multiple enterprise applications across systems; mergers & acquisitions; restructuring, and other change management initiatives. Learn about what companies can do to accelerate the pace of innovation and deploy new technologies faster, while remaining confident in the functionality and reliability of all business processes. Gain insights into how SAP HANA (R) can help reduce the backlog of technology deployments, providing for shorter timelines, higher quality, lower costs, and less risk.